A college education may be called the great equalizer, but when it comes to the gender wage gap, it still has some ways to go. Among federal financial aid recipients, working women’s earnings 10 years after they first enrolled in college are lower than working men’s earnings only six years after enrolling at public and private nonprofit four-year colleges. This finding comes from a Center for American Progress analysis of data released with the College Scorecard, an online consumer choice tool updated by the U.S. Department of Education last fall that contains information on institutions of higher education. In particular, the scorecard includes the first comprehensive look at students’ mean earnings by institution and gender based on the year they first enrolled in college. 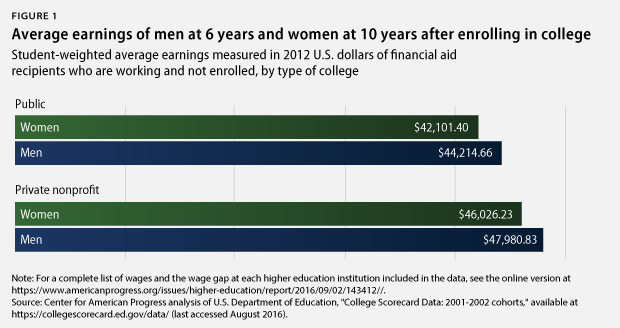 Obtained through a data match with the U.S. Department of the Treasury, this information provides a robust picture of how quickly the gender wage gap materializes and grows after college. While the gender wage gap is nothing new, the picture painted by the College Scorecard earnings data is not pretty. Across every college sector and level of selectivity, women who received federal aid had lower annual earnings 10 years after entering higher education than the annual earnings of their male peers only six years after entering. This holds true both before and after adjusting the earnings data for inflation. For students from the nation’s most elite colleges, men’s earnings outpace women’s by tens of thousands of dollars each year, with gaps showing up soon after they enter the workforce. And while there are some colleges whose female students earn more after leaving than their male students, women from these schools have lower-than-average earnings that only narrowly outpace their male peers’. CAP’s findings are particularly distressing because the data are constructed in a way that should, if anything, produce better results for women. First, the data include earnings for both college graduates and dropouts. Since college graduates generally earn much more than those who do not graduate, this data construction should benefit women, who graduate at a rate roughly 6 percentage points higher than that of men. Second, the data only include earnings information for people who are working and have net earnings. Since women have a slightly lower workforce participation rate than men, this means their average income figures are not pulled down by a higher number of people with zero earnings. These findings do not challenge the broader message that higher education matters. College graduates are likely to have higher earnings, higher employment, and lower chances of defaulting on their student loans than workers without a degree. And women with a college degree earn more than women without one. However, CAP’s findings show that the current state of higher education is not sufficiently equalizing the salary gap by gender. For women, a college degree does not guarantee an equal increase in earnings compared with male graduates from the same college. Though the analysis shows higher education alone may not be enough to close the gender wage gap, it also suggests that institutions and policymakers must pay more attention to other elements of higher education besides completion that might affect what someone earns. This includes what major students choose, their path to graduate school, and what career opportunities they receive. 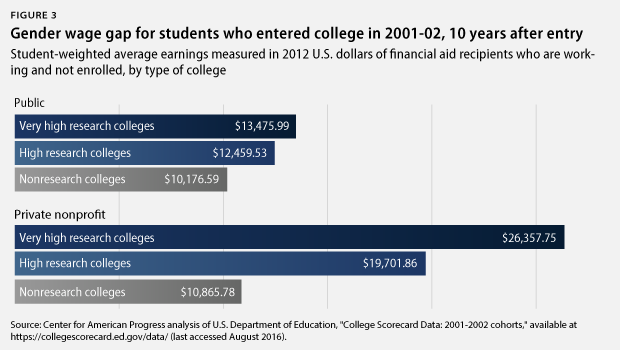 This analysis relies on data from the College Scorecard, which measures earnings among all students who received financial aid, are no longer enrolled, and are working six years and 10 years after first entering college. The scorecard contains data for cohorts of students entering college from the 1997-98 to 2005-06 academic years. The U.S. Department of Education obtained these earnings data by linking information on individuals who received federal student grants and loans with tax records held by the U.S. Department of the Treasury. The average earnings data are pooled across two years of entering cohorts to avoid variability. The data are also only provided at the institutional level, meaning it is not possible to see data on earnings by program, major type, or other similar categories. The data are not broken down by race or other important demographic indicators. To gain a better understanding of how earnings vary between women and men and how the gender wage gap grows over time, this analysis focuses on students who entered public and private nonprofit four-year colleges in 2001 or 2002, the most recent cohort that includes both six- and 10-year data. This means the six-year figures represent earnings for individuals in calendar years 2007 and 2008, while the 10-year data reflect earnings from calendar years 2011 and 2012. To ensure a fair data comparison across years, CAP adjusted all earnings information into 2012 dollars using the consumer price index. CAP chose 2012 because this reflects the most recent calendar year of earnings data. All mean figures reflect the student-weighted average. This issue brief offers a complete look at the key findings. Among federal financial aid recipients who attended public and private nonprofit four-year colleges, are no longer enrolled, and are working, average women’s earnings 10 years after they first enrolled are lower than average men’s earnings six years after first enrolling. This is no small gap. Across both public and private nonprofit four-year colleges, men’s earnings at the six-year mark are approximately $4,000 higher per year than women’s at 10 years. Several factors likely influence the wide gap in earnings. One cause may be variation in college majors and career choices between men and women. 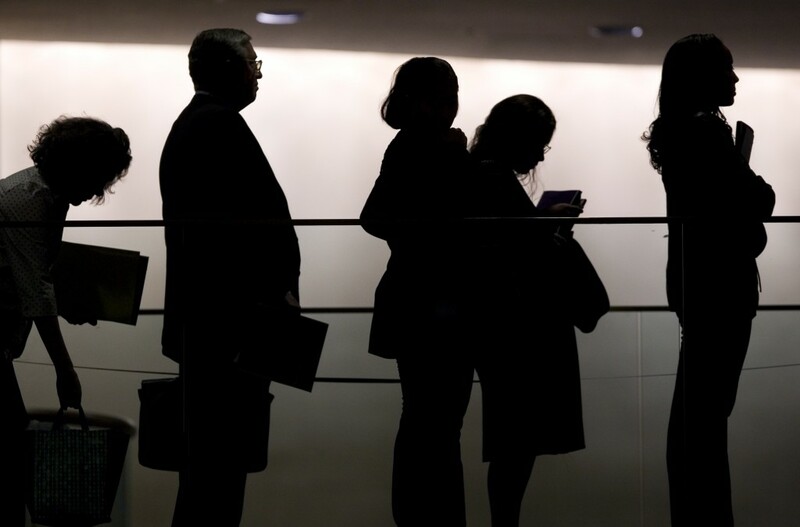 For example, one of the large contributing factors to the gender wage gap is occupation differences, which account for as much as 49 percent of the pay disparity. Differences in who enrolls in graduate school and what programs they study may also affect the gap. Individuals with a graduate degree tend to earn much more than those who only complete a bachelor’s degree. But the returns of graduate school can vary a lot depending on what a student studies. For example, someone with a master’s in computer science tends to make upwards of $100,000 per year while an individual with a master’s in social work tends to earn $40,000 per year. In general, women appear to enroll in graduate fields with lower economic returns than those chosen by men. In 2014, women enrolling in graduate school were significantly overrepresented in lower-earning fields—including public administration, health sciences, and education fields—encompassing roughly 75 percent or more of all enrollments. In contrast, women were significantly underrepresented in higher-earning fields, such as engineering, math, business, and computer sciences. While these may be influencing factors, their impact cannot be measured because College Scorecard earnings are not disaggregated by major, occupation, or graduate school enrollment. Finally, it is possible that women leaving the workforce to care for children and family and then returning to work may result in lower wages at the 10-year mark. As much as 10 percent of the gender wage gap is a result of women spending less time in the workforce, often in a caregiving role. This would not, however, be as likely to explain the gaps that already exist six years after entry. Earnings data in the College Scorecard include both college graduates and dropouts. This should in theory help the results for women because college completers earn more than those who do not finish, and women graduate college at higher rates than men. For example, for first-time, full-time students who entered public four-year colleges in 2002, roughly 58 percent of women graduated in six years compared with only 52 percent of men. At private nonprofit four-year colleges, 68 percent of women completed in six years compared with only 62 percent of men. While the gap is sizable, CAP’s findings likely understate the extent of the wage gap for college graduates, since women are earning less despite higher completion rates. The figure below shows the breakdown in the gender gap by college selectivity. CAP grouped colleges into three categories using the Carnegie Basic Classification system, a framework for sorting colleges into groups according to shared characteristics. CAP’s categories are very high research, high research, and nonresearch colleges. This breakdown shows that while women who enrolled at elite—or very high research—colleges have the highest earnings among women, they also experience the largest gender wage gap compared with their male peers. Among the most elite four-year private nonprofit colleges—universities such as Harvard, Stanford, and Princeton—male federal aid recipients earn $26,000 per year more on average than their female peers 10 years after enrolling. By contrast, the gender wage gap is approximately $10,000 per year for those from nonresearch private nonprofits. Among public colleges, the wage gap among research and nonresearch institutions is smaller, ranging from a high of roughly $13,000 per year for very high research colleges to $10,000 per year for nonresearch colleges. Even though the gender gap in earnings is highest among elite colleges, women from these schools earn significantly higher wages than women from other types of colleges. For example, women from the most elite nonprofit schools earn an average of $75,000 per year 10 years after enrolling compared with an average of $44,000 among women from other private nonprofits. For elite public colleges, women earn an average of $50,000 per year after 10 years compared with an average of $39,000 among women from other public colleges. It is unclear why the gap is so large for students from these schools. It may be that men are much more likely to earn high-paying graduate and professional degrees. Men from these schools also might be more likely to enter occupations with higher earnings, such as jobs in a STEM field—science, technology, engineering, and math—or the business and finance sector. Unfortunately, the College Scorecard data cannot shed light on these issues because they do not break down earnings by college major or occupation. Without more information, it is impossible to single out a cause. Part of the wage gap reversal, particularly among HBCUs, may be caused by a higher graduation rate gap between women and men at these schools than for the overall population. For example, while women overall graduate at rates 6 percentage points higher than men, among students attending HBCUs, this gap is twice as large. Among first-time, full-time students that enrolled in public four-year HBCUs in 2002, six-year graduation rates were 12 percentage points higher for women than men—38 percent and 26 percent, respectively. At private nonprofit four-year HBCUs, black women’s six-year graduation rates were 14 percentage points higher than black men—45 percent and 31 percent, respectively. As a result, women measured at these schools include a much larger share of college graduates, relative to their male counterparts, than earnings cohorts at other colleges. This analysis intentionally excludes institutions for which CAP has reason to believe the earnings data are either less representative of the college or the school itself appears to be in an anomalous situation. First, this analysis focuses on data from four-year public and private nonprofit colleges because these schools are more likely to have students who enroll directly from high school and to have fewer transfer students. In contrast, community and for-profit colleges are more likely to enroll students who are older and have years of work experience before entering, which may affect average earnings for these schools. Many community college students also go on to complete bachelor’s degrees, which makes it harder to isolate the earnings returns from these institutions. Second, the analysis excludes colleges that had missing or seemingly anomalous data. CAP removed any school for which the U.S. Department of Education did not report earnings data by gender. This mostly eliminated theological schools that likely did not have earnings data due to small sample sizes. The analysis also excludes institutions identified by the Carnegie Basic Classification system as medical or health professions schools because they appear to serve mostly graduate students. While the scorecard data only include earnings for students who borrowed at the undergraduate level, it is also possible that students at these schools attended joint bachelor’s and graduate degree programs, so some of these students may be represented in the data. This might explain why students at these schools had abnormally high earnings compared to the overall cohort. Similarly, during its compilation of the scorecard, the U.S. Department of Education found evidence of misreporting in which some schools that only serve graduate students listed students as undergraduates. Overall, these exclusions account for a small share of the total cohort. Only 10 percent of federal aid recipients at private nonprofits and less than 1 percent of federal aid recipients at public 4-year colleges fall in these categories. 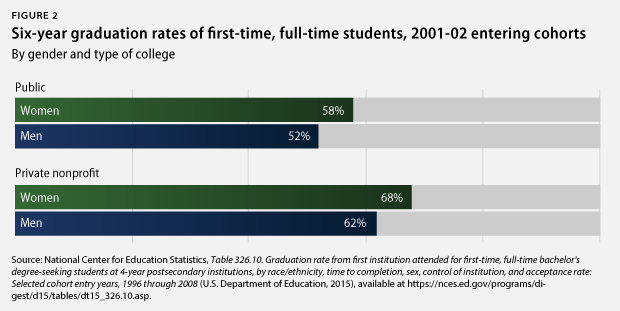 Lastly, completion data used in this issue brief come from the Integrated Postsecondary Education Data System, or IPEDS, which considers first-time, full-time students. In contrast, the earnings data in this issue brief includes earnings for all students who received federal aid. This measure includes a broader population of students because it also includes part-time and transfer students. While these two measures are slightly different in terms of which students they include, the scorecard’s comparable measures of completion for all financial aid recipients by gender were heavily suppressed due to privacy concerns and would not produce an accurate picture of graduation rates. Education can go a long way toward improving an individual’s economic circumstances. But as this brief shows, simply enrolling in or completing college cannot be the end of the conversation about closing the gender wage gap. While more education brings higher earnings for men and women alike, the earnings are much lower for women despite their higher graduation rates. In fact some estimates suggest that women need to earn a doctoral degree in order to earn as much as men with a bachelor’s degree. While stakeholders and policymakers should continue to think about solutions beyond education—such as paid family leave, pay transparency, and high-quality child care—they also need to consider the factors in higher education policy solutions that may contribute to the wage gap. More research on the impacts of college major and career choice on earnings by gender could help shed light on what colleges can do to decrease the wage gap. Antoinette Flores is a Policy Analyst on the Postsecondary Education Policy team at the Center for American Progress.